we need a new building. we PURCHASED our dream space. we need to raise $2,000,000 to move in. Detroit Prep is continuing to add one grade level each year and, after this year, we will no longer fit in our current space. We need to buy a school building of our own! We've found our dream building (more on that below) and we need to raise $2,000,000 in two years in order to make this dream a reality. We need cash! Every dollar that you are able to give will make a huge impact on our school. We will squeeze the use out of every single penny. Please please please consider digging as deep as possible and making a gift to our building project. We need materials! Are you a vendor that sells lights? Carpet? Furniture? Paint? If so, please e-mail us right this second. We want to give you a tax receipt for your generosity and shout about your greatness from the mountain tops. We will be the best partner you could ever imagine. We need you to tell everyone you know! When you donate, we will send you a unique image like the one you see below. The image will feature a number corresponding to what number donor you were! Share it on Facebook, Instagram, and Twitter right away and, if you are feeling super kind and supportive, make this image your social media profile picture for a month. Your friends and family are probably (almost) as awesome as you are and so sharing our mission with them will be an enormous help for Detroit Prep! Even if you can't donate, sharing our fundraiser and our updates is a tremendous help. We need your muscles! We will have lots of chances to come get your hands dirty on the building! Sign up for updates here and be sure to follow us on Facebook, Instagram, and Twitter. We need you to come hang out! Come to our events and bring your friends! Since this is a two year-long fundraiser, we will be hosting lots of events to meet you, thank you face-to-face, and to make giving a little bit more fun :) Follow us on Facebook, Instagram, and Twitter for updates! We truly, seriously need it. If we can't raise the money to move into our building, our school's entire trajectory will be in jeopardy -- our current facility can no longer accommodate us and there are no affordable alternatives nearby! Pingree Park is a really great neighborhood that deserves a huge source of blight to be returned to its original use as a school and community hub. Research shows that schools can reinvigorate a neighborhood fast and authentically, and this community truly deserves it. Because every child, regardless of race, ethnicity, socioeconomic status, or zip-code deserves a world-class and equitable education. We give all students a foundation of academic excellence and character development while fostering a love of learning and passion for exploring and fulfilling their extraordinary potential as learners, leaders, and world-changers. This new building will help us do that. When you donate, a few things will happen. You will move us one step closer to bringing an abandoned building back to life, to bringing an excellent school to a great neighborhood, and to giving our students the joyful, safe place that they deserve to learn in. We will send you a really cute unique image that corresponds to what number donor you were. (See above example.) We will ask you to share it on every social media platform you can. We will also ask you to make it your profile photo for a month or so. If you donate over $100, we will send you this really awesome keychain as a gift and memento for helping us move into our forever home. If you donate over $1,000, we will send you a keychain and pennant! You're an important part of our team, and we want you to feel like it. Let us name something special in your honor. $1,000,000 is a lot of money. Your generous gift (that will make such a huge impact on our entire school & community) should be recognized for years to come. $250,000 // So much important community time is spent in the cafeteria. We'd love to dedicate ours to you! $100,000 // We'd love to name a classroom of your choice in your honor! $50,000 // We will name a student reflection room after you, which will be at the end of each hallway as a safe space and haven. $25,000 // We believe libraries should be the heart of every classroom. Let us put a classroom library in your name! $10,000 // We will personalize a plaque for a student locker with your name (or another name of your choice)! The Born and Raised Detroit Foundation generously offered $10,000 when we reached our first 500 donors! The team from Grey Ghost, along with the city’s top chefs raised $75,000 at our 1st Annual Chef’s Schoolyard in April 2018. The incredibly generous Madonna has announced a $100,000 matching challenge grant! Isn't it perfect? We love it. We fought like crazy to own it. It is less than 1 mile from our current location, which means we can maintain our same bus routes and continue to serve our families! It is located in Pingree Park, a really awesome neighborhood with lots of kids and families that need an excellent school option! The building is 43,500 square feet and has 21 classrooms and 3 levels. It has hundred-year-old oak floors, space for a kitchen, cafeteria, and small gathering/performance space. This means it will hold us until we are at capacity, serving kindergarten through 8th grade. We will have space to build a playground and an outdoor learning space to support our project-based learning curriculum! In our current facility, we have no playstructure and a very tiny space for our students to play outdoors. Our future forever school home was formerly known as the Anna M. Joyce Elementary School. Without fail, every single time we are at the building, a neighbor stops us to tell us a story about the school back when it filled with Detroit students. We knew that it would be doing a disservice to the incredible history of the building if we didn’t honor it in some way. We have a crazy idea that we can fund the renovation of an entire classroom just through the sales of these limited-edition goodies. Pro-tip: they make great gifts. This limited edition crewneck sweatshirt is the perfect edition to any closet. It is comfortable, soft, and says, "Hey! I care about style AND giving kids in Detroit an incredible and equitable education in a world-class building." 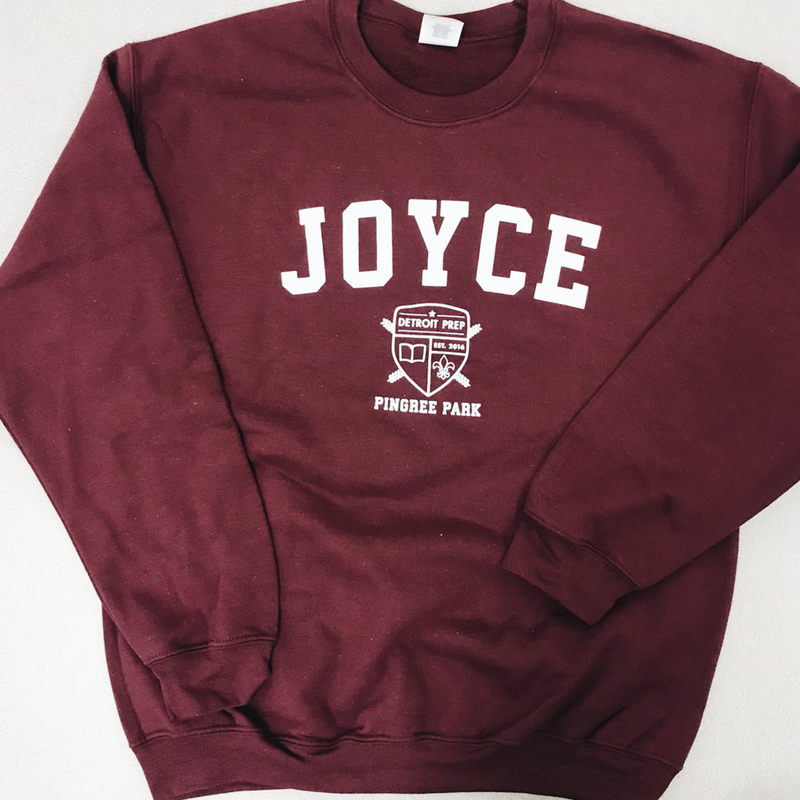 You may want to buy two since a friend may see you wearing your new JOYCE sweatshirt and want to permanently borrow it. The JOYCE candle fully embraces the elements about our #DPforeverhome that we love the most: the original hardwood floors, the antique leather-wrapped doors, and the fresh air of our new neighborhood community, Pingree Park. These clean burning, biodegradable, 100% soy wax candles with wooden wicks are hand-poured into a gold tin. The weather is getting chillier, which means our skin is getting dryer. Looking for a hydrating lip balm? Or need an extra to put in your car, purse, drawer, bag, and everywhere? 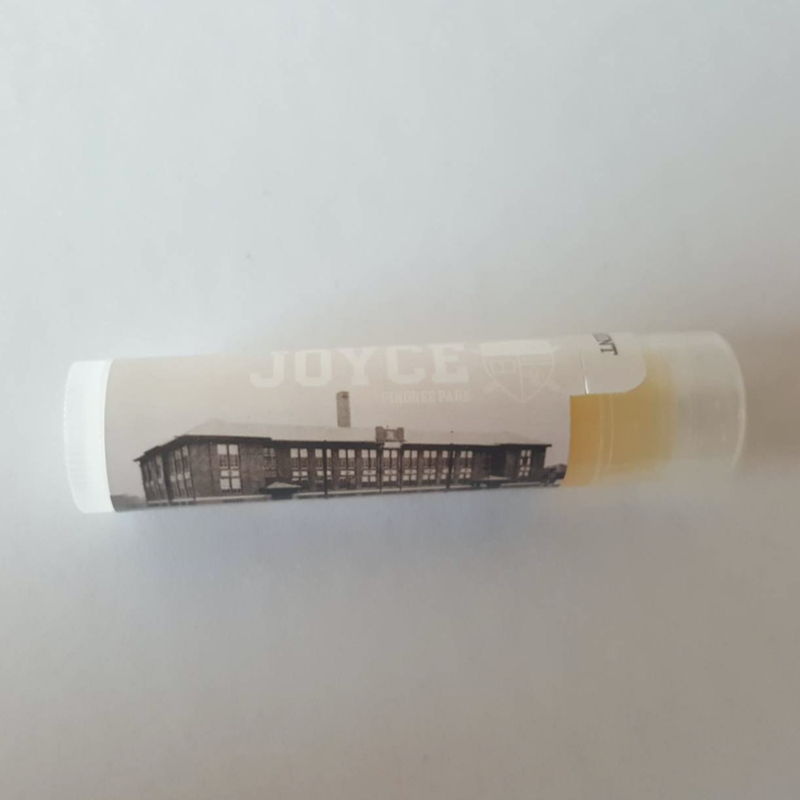 These mint lip balms are handmade in the United States and labeled with a special old photo of our future school home to serve as a reminder that you helped make this happen. We feel so excited, and so grateful to be moving into our #DPforeverhome in just a few months. We know that this big, old, three-story building (more on that below) is beautiful and perfect for our forever school home. But it also has A LOT of stairs. This fall, we are going to install a new elevator to ensure that ALL of our students, staff, families, and neighbors can access and use all of the spaces in our entire building for years to come. We need to put down a $45,000 cash deposit ASAP to make it possible for us to move in by December. Would you consider supporting us as we work to live out our mission of providing a "world-class and equitable education" in Detroit? Help us purchase our elevator! 2. Share about our campaign with a friend or two! The more people who donate, the quicker we will be able to install our elevator and move in to our new space. 3. Create a Facebook Fundraiser! This is an easy way to spread the word and create an even larger network reach! Instructions to create your own fundraiser can be found here. Thank you so much for your endless support -- we couldn't do This without you.